My quick overview of the Fisher Career Fair! You know Fisher is a great school. You know its programs (both undergraduate and graduate) rank among the very best in the world. You know the faculty, staff, and other students you’ll interact with are incredible. But do you know about the Fisher Fall Career Fair? 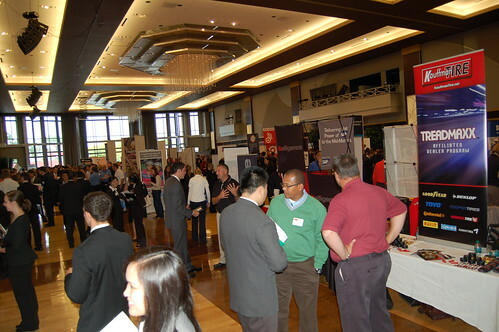 The Career Fair is one of Fisher’s greatest assets. Over 130 employers fill the Ohio Union, seeking Fisher’s best and brightest students for internships and full-time careers. And with the quality of Fisher students, they’ve got a tough time ahead sorting through all of those qualified students’ resumes. Things kick off at 10.30 and go until 4.30. Not only do you get the chance to talk to recruiters on the day of the Career Fair, but most of the employers will set up interviews on the spot as early as the next day. Talking to recruiters at the Fair is also a great way to gauge how much you like the company’s vibes without actually having to interview. It’s basically a free mini-interview! Fisher also provides special transportation for us students, seeing as how the Union isn’t the closest building to Gerlach (or Schoenbaum, for undergraduates). There is a dedicated CABS (Campus Area Bus Service) line that runs from Fisher to the Union every 15 minutes. This is great, since you don’t have to worry about getting sweaty rushing to the Union and then shaking the recruiter from your dream company’s hand!! A coat check is also provided, as it does get warm inside. Finally, there are numerous ways Fisher helps us prepare to be at our best for the Career Fair. There is a student guidebook, a slideshow presentation on how to prepare, and an excellent Career Management team that you can schedule appointments with. The Career Management team is a wonderful resource to use, especially if you want an extra set of eyes on your resume or would like to practice with some mock interviews. You can check out the student guidebook and a little more information on this year’s fair here. 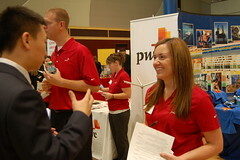 I spoke with a student that attended the Career Fair to get their perspective as well! In summary, the Career Fair is one of the greatest services Fisher provides. It is an incredible opportunity given to us as students to develop both personally and professionally. The slew of resources available to help us prepare for the Career Fair is even more impressive, and we are very lucky to have them at our disposal. A rolling stone… well, you know the rest. This past week has been a haze of interviews, midterms, projects, group meetings, phone calls and of course, the everyday tasks – like eating, sleeping (hopefully! ), cleaning, etc. Although the Class of 2011 technically has until graduation (mid-June) to find a full-time career… it seems like you’re behind if you’re not madly rushing to second-round interviews at a hectic pace. For me, it’s been a busy few weeks – it really forces you to decide whether a company is a good fit for you, when you need to either skip class, miss hanging out with friends, or otherwise disrupt your life to attend second-round interviews. I had the good fortune of interviewing with Belden, in Richmond, IN this past Monday. The plant tour made me nostalgic for Owens Corning, my previous employer. Once you’ve worked in manufacturing, you either realize you love it (like me), or you get the heck out. I also was invited up to the Paint & Coatings Division of Sherwin-Williams in Cleveland, OH. Having worked as a painter and a maintenance tech for a number of years, I knew enough about their products to have a very engaging conversation with the CEO of this company at the Fisher Scholar’s luncheon a few weeks ago. I am very grateful that he thought highly enough of me to pass my information along to this division. In other news, 5 Class of 2011 MBA students will be traveling to Arkansas this Thursday – Sunday to compete in a Graduate Logistics Case Competition, sponsored mainly by Sam’s Club. I have not been to Arkansas for a few years, and I’m excited to compete in another case competition – the Internal Case Competition last year was extremely rewarding! In case no one else has mentioned it yet, this past Friday was the annual Fisher MBA Halloween party. This time it was held at Callahan’s, in the Arena district. Everyone appeared to having a great time! It was nice to be able to mingle with first and second year students, as well as those from other programs, and their friends and significant others. An important part of maintaining sanity in graduate programs is having a solid support network of friends, and being able to loosen up and “check out” every once in awhile. A big thanks to the Fisher Graduate Student Association Social Chairs for setting up this event! Check back for another post next week – I look forward to telling you about how the Logistics Case Competition went! As I sit (in a very cushy) suite at the Hampton Inn in Richmond, Indiana, I realize that I will spend nearly 20% of my time in the foreseeable future in places like this. Second round (on-site) interviews are a complicated dance between potential employers and employees. It’s not only a chance for you to impress them, but for them to woo you as well. Case in point. Upon checking in to this particular Hampton, I received a “goody” bag with two pens, a flashlight, a chocolate bar, a box of color-coordinated M&M’s, a book and a leather-ensconced flash drive (never seen one of those before). This evening, a group of company representatives will be chauffeuring us to the infamous pre-interview dinner. For those of you that may not have participated in one of these yet, be warned, it is 100% NOT about the food. Remember to be polite, ask questions, and most importantly, follow the lead of the company representatives. If they order an adult beverage, feel free to, but I recommend sticking with water or a soda, just to be safe. Remember you are there to interact with your potential employer. It’s fine to talk with the other students, but be cognizant of the things you say, and the tone of your voice, as well as your body language. Tomorrow is a tour of the headquarters, as well as one of their distribution facility, then a full afternoon of interviewing. It’s important to remember that you should not take anything for granted at any point in this process – even though you may have scored some “loot”, you must continue to show why YOU are the most qualified, most sincere, and most likely to succeed. I wish all of you in this position the best of luck – remember you have many resources you can reach out to, such as the Career Management Office, other students, mentors, alumnus, and so many more. Rejection is something with which we all must contend. Most people have had a significant other give the “it’s not you, it’s me” speech. Some people didn’t get into their desired college, and most have been denied a job at some point. Either way, you never can quite prepare yourself for the sting of hearing “no, I/we don’t want you.” It can be tough on a person’s self-esteem to be rejected in rapid-fire over the course of just a few weeks. Of course the psych undergrad in me wants to see the psychological implications of it all. And it can be even harder not to receive direct feedback once the process is over. I think it is important overall to let the rejection roll off the shoulders and remember that spaces are limited. However, in some sense, it is also worthwhile to consider the consistent mistakes we all make that can have an effect. Did I show up a little late? Did I say “um” or “like” too much? Did I shake uncontrollably? (Well of course not, but you could see why that might make a recruiter uncomfortable). Since most of the fall interviewing process is over, everyone can take solace in the encouraging words of graduates and second-years at orientation — don’t worry, we did not receive initial offers during fall quarter. So no need to sweat too much yet — there’s still time. We’ve all seen that guy, “the schmoozer”, that seems to be able to go up and talk to anyone in the room about anything. We all stand back and wonder how he knows so many people and whether his type of networking is really all that important. I’m here to tell you, it’s pretty important. While it’s important to be genuine and not just talk to every recruiter in the room for the heck of it, it’s also very important to get out of your comfort zone and put yourself out there in a room full of potential employers. One thing I’ve picked up since starting my MBA, is how serious Fisher is about networking. We’ve already had several events to teach us how to improve our networking skills, and numerous other events that have given us the opportunity to use what we just learned in front of potential employers. We’ve all heard this idea countless times, and I think the meaning gets lost on all of us at some point. But this idea continues to emphasize the importance of networking, he got to where he is today because of who he knows, not what he knows. Work on a 15-30 second pitch that includes you background and major selling points. Research different companies you want to talk to at the event and develop informed questions. Warm up with a few other companies before you talk to your #1. Exude confidence and act like you deserve to be there. In the end, don’t forget to exchange business cards and make a call to action. Ask if they’re interviewing on campus or what the next steps are in the interview process. If you get a chance before you come to Fisher, make a list of friends you know at companies you might want to work for. Talk to them about their day-to-day, how they like working at their company, etc. If you need to, perform informational interviews within companies you might be interested in. The more you get done before you start classes the better, because spare time is hard to find. Getting started on this will help you shape your career goals and the companies you want to work for, it might also help you identify key people to talk to in order to get an interview. You never know how valuable a relationship might turn out to be, so go out and make some more connections. Admittedly, I’m not the best networker out there, there are multiple ways to network though. In the past when I was afraid of being that guy, I made sure to become friends with that guy. My relationship with that guy (who happened to have a much bigger network than me) ultimately paid off in the form of a great marketing internship last summer.